Conor McKenna is attracting interest from a number of Australian Rules clubs after impressing on a developmental camp in London last week. The 18-year-old from Eglish contended for the man-of-the-match honours in a combined game with Australian Rules players, scoring four goals. McKenna impressed with his searing pace in his first Australian Rules game. It is understood that up to six clubs are interested in the possibility of recruiting the talented teenager. He also stood out when a European selection played against a strong Australian Institute of Sport/AFL Academy side. 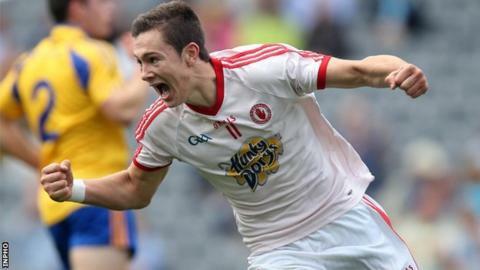 McKenna was one of the stars of last year's minor championship, earning man-of-the-match accolades from the Ulster final and All-Ireland semi-final, and scoring a goal in the All-Ireland final defeat by Mayo. He continued that scintillating form with St Patrick's Armagh and scored 1-7 in their MacRory Cup defeat by St Patrick's Maghera. The Red Hand county man initially caught the eye in December's talent combine in Dublin.